I’ve been boo-hooing table saws for awhile now as a means of breaking up sheet goods due to the huge amount of floor space an accurate setup requires. Can you do it in a 2 car garage? sure, but you sacrifice a lot of footage and flexibility to the gods of full-sheet capacity. People here ask about making panel saws here and there and I’ve mentioned my Striebig-inspired saw design, really just a giant jig for a circular saw. Let me put my money where my mouth is and show the saw in its nearly-complete state with most of the construction issues worked out. In my experience most panel rips involve ripping 4×8 sheets into 24” halves and 12” quarters. This requires 8 feet minimum fore and aft on the table saw plus lots of fussing with outfeed setups or a permanent space-hogging setup. I had one of those $400 flip-up outfeed roller tables on one of my table saws (saw no longer owned) and it was cool and made losing a sheet when ripping a non-issue but loading and holding a 60-90lb sheet and holding it tight to the fence was never a satisfactory process due to three factors: injuries, panel damage in handling, and inaccuracy of the ripped line. A power feeder would have made the cut more accurate but the injury and panel damage factors are still going to be factors when ripping heavy sheets solo on any table saw except a serious space-hog. Now crosscuts of panels fall into a few categories. The most troublesome are square and chip-free cuts of 4’ wide veneered and melamine sheets. After that, 24” (more or less) pantry sides are a hassle. The amount of support required on both sides of the blade on a table saw is enormous, and with a sliding table saw or attachment-with-outrigger type setup the space-hog factor is considerable in a small shop. Then there’s table tops and things like that, but those jobs often pay a little better than sheet-good cabinets so square-cutting the ends is not so much a time hassle. Normal base and upper cabinet sides can be done on the table saw with a cross-cut box and the 4×8 sheets can be hacked-down to rough size with a tool as crude as a Sawzall if you like. The solution that’s worked for me in different iterations over the years is a succession of vertical panel saws used for rough cutting big sheets most of the time and the table saw used for finish cuts in parts under 25 lbs. most of the time. I would rather get finish cuts off the panel saw of course, but each of my previous three vertical saws (an old DeWalt, a SSC, and a PanelKing) had liabilities. The PanelKing (out of of production) was the best for cabinet work and could do exacting, low-chip cuts but was a hassle to set up for every cut. The two previous saws could cut square and rip straight but the cut edge quality was poor in terms of splintering and tear-out. These are the type of saws you see at lumberyards. Sure, they can cut square but the cuts are not suitable for cabinetry. I also had a Festool setup and it was alright and made straight, reasonably chip-free cuts and had good dust collection but squareness and repeatability were a hassle. This was before the Festool line was expanded to include the new guide rails and the newer system of squaring and duplicating panel cuts. Festool is great stuff, but the cost to get the whole new setup to make square panel cuts was just a bit out of hand. 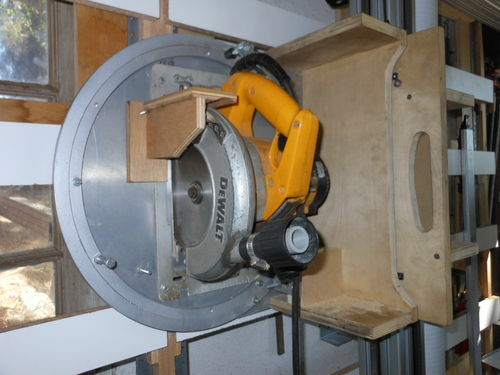 Finally I found a writeup by a woodworker who had copied a Holz-her saw he had owned using a Festool saw as the engine. 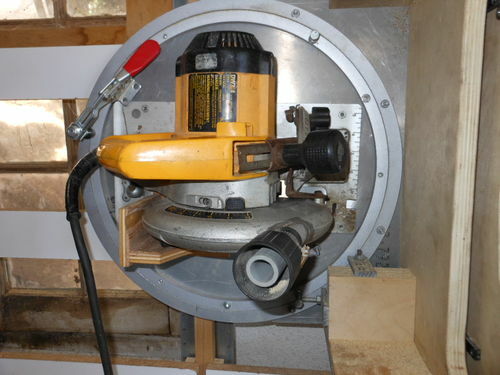 Having owned a Festool saw I wasn’t sufficiently persuaded that the plunge and dust collection made the dollar cost worth it so I used a DeWalt saw with a brake and a depth adjustment knob which is more accessible from position the saw is in when installed as a driver for a vertical panel saw. The saw is nothing special and was acquired used for $50 or something but it does have plenty of power, a brake, and easier depth adjustment due to the top-side position of the depth adjustment knob. The saw model is DW364K if you want to research its strengths and its flaws. Now building my own panel saw in this style has entailed a lot of head-scratching and hunting for parts. Actual assembly hasn’t been too onerous but the mental part of figuring it out has been pretty involved. I’ve had fun building it and while it hasn’t made its first cut yet, I’m confident I’ll get the kind of results I was after when I started building it. I anticipated the saw motor and arbor stability being the weakest link. 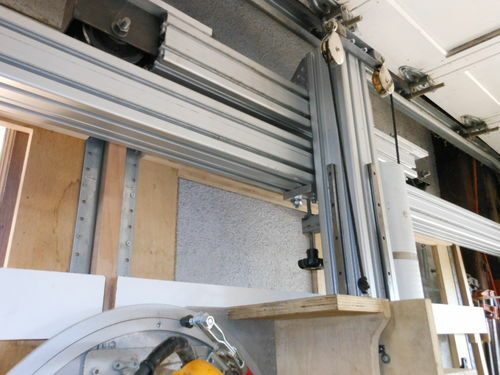 Early on I tried to make a 14’ long top beam out of MDF but it didn’t work out and in my searching for a surplus steel box beam I ran across some heavy duty 90mm square aluminum extrusion used for making industrial enclosures, CNC machine frames and stuff like that. The advantage of the extrusion is it is very straight over its whole length and stiff enough to handle the total weight of the carriage which is about 120 lbs. and has a 30 lb counterweight inside the vertical beam. 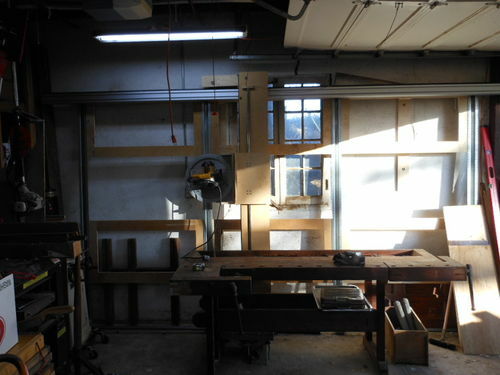 The advantage of building my own is that it can be sized to fit in my shop both in terms of length and, more critically, height. The commercial panel saws in this style are pretty tall and I’ve had opportunities to buy some used ones at very good prices. 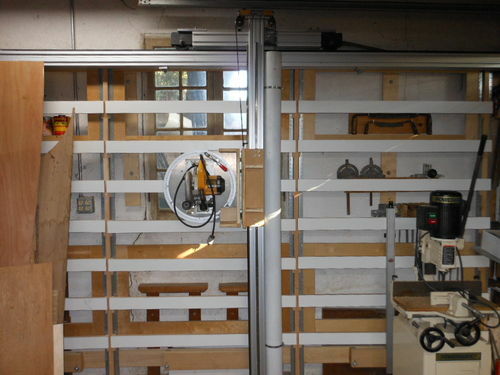 I am sure the commercial saws with their scoring arbors, big 3 phase motors and heavy construction would out-produce my version in terms of power and speed, but moving one to my shop would be a hassle and it wouldn’t fit vertically anyway with the rollup door in the way. I am anticipating a crosscut capacity of 60”-66” which is comparable to some of the commercial models despite my rig’s shorter overall height. Ripping capacity is going to be somewhere in the 12 foot range. This thing sound really cool. I’ve been taking a woodworking/ cabinet class at our local community college for 5 simesters. In class there’s a Her Saf panel router with 36 inch cross cut capacity and air clamping system. Have you considered building your saw so it could also guide a router? When set up properly these panel routers work great on dados, grooves, or other detail cuts. One of the instructors and I have been trying to buy a used panel router for his home shop. He was out bid recently in an auction that had three different machines. 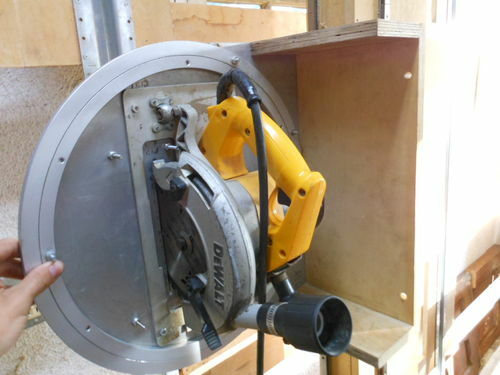 Now we are kicking around the idea of building a home made panel saw/ router. Thanks for sharing your saw project. After you get it finished and cutting scary straight, can you do a quick video of this thing in action. would be cut into easily. added a stop system at the left side yet. require a lower locking mechanism though. a tube presented a simple, safe, and aesthetic solution. crosscut positions. It’s kind of crude but it works. degrees for switching between rip and crosscut positions. that is fantastic. studying your pictures and i’m sketching designs of my own. they definitely involve lengths of extruded aluminum and various bearing solutions. much finished now except for vertical and horizontal scales. I know its been 6 years since you made this saw, but it is still awesome. I came across it while doing research on making my own. I watched your video. As far as I can tell, your saw and the festool guy who made a similar one have the best two shop made panel saws documented on the net. One question: how do you avoid cutting into the support latice on cross-cuts? Do you just remove the slats below the cut? If so, it seems like that’d leave the work unsupported for about 2 feet in the worst case. but maybe that’s just fine? and other times cut into them.